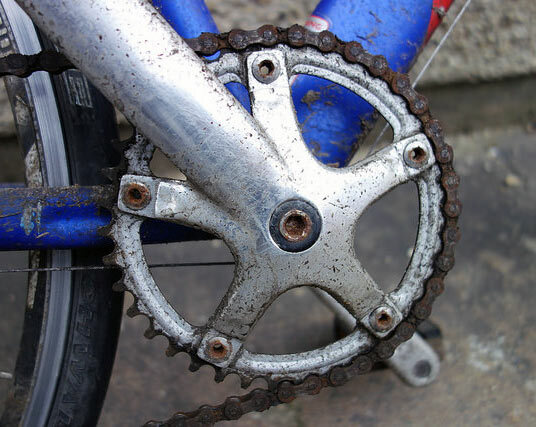 My early spring bike service and headset maintenance – what to look out for and how to fix problems. There has been a lot of salty water on the roads this winter. It’s not been the coldest winter, but it has been dipping below freezing enough for the roads to be salted and then wet. The result is bikes ridden through the winter will have taken a battering. 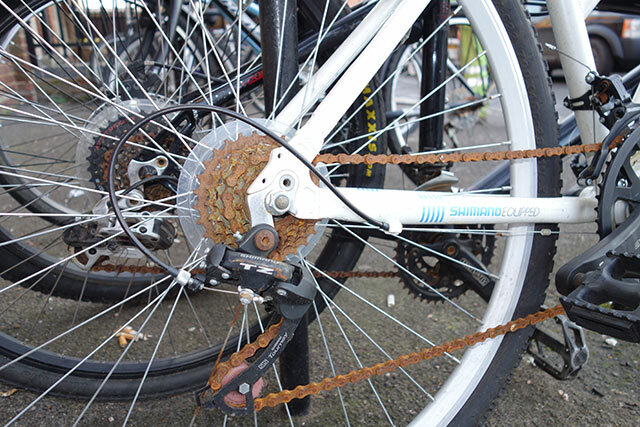 Everywhere in Oxford I see rusty chains – a sure sign of riding through winter salted roads. I keep using TF2 chain lube, but even regular squirts can’t stop minor rusting. Ideally, I would leave a bike service for another month (when hopefully the salting of the roads would finish), but the commuting bike has been driven into the ground so it was time to get another service from Sherwood Mobile Bike Mechanics. I bought a new chain and cassette for Andy to put on. I thought the brake cable had gone, but actually it was the rear brake frozen up, due to rust. Andy cleaned the brake and regreased and changed the most worn components. I’m not too fussy about the commuting bike, but Andy felt the headset needed attention. I haven’t pain any attention to headset maintenance and have never really understood headsets – so I got Andy to write his tips for headset wear towards the end of the post. 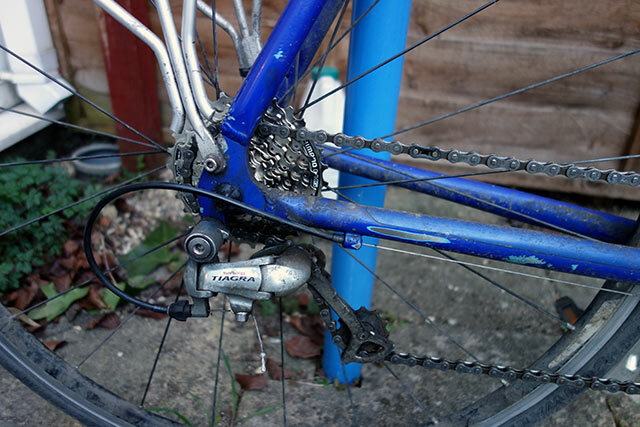 In the end it was quite a lengthy service, but that is inevitable when you cycle on it so much during the winter. After the service the bike runs like a completely different bike! I keep a tight chain because I have a single ring and no front mech to stop chain dropping off. A clunk when applying front brake. Orange/brown staining around junction of forks to bike frame. With the bike in a stand, and the front brake applied in a fast firm grasp, a shudder can be felt in the bike. this can sometimes be from loose front wheel bearings, but is almost always going to be play in the headset bearings. On a seasoned bike, its rare for a headset to have loosened its self. (check that the locking nut is secure against the upper cone nut). Unless the upper cone nut has loosened against the locking nut, then some play has appeared from somewhere. This play will have arisen as a result in corrosion in the headset bearings due generally to rust. This rust will have come from the ball bearings and the cage, rusting as they have ran out of grease that lubricates them and protects them from moisture/air. As they have rusted, they have got smaller in diameter. Ideally, these bearings should be replaced. Scoring/corrosion could also have eaten into the bearing races (the cup that hugs the balls) if this has happened, you will need to replace the cups (which means a new headset). To discover what state they are in (in a primitive kind of way), you can undo the locking nut fully and unscrew the upper cone fully. With the front wheel removed, the fork can be lowered so that the lower bearings are also exposed. If these lower bearings have been installed without a cage, of the cage has rusted away completely, be prepared to cry and the bearings fall out around your feet. Grease the ball bearings in the lower race and push the forks back up. grease the upper bearings, and screw down the upper cone nut. once this is screwed down enough to stop the forks rocking about, screw down the locking nut so that it meets the upper cone nut. Put the bike in a stand and check that the forks can be turned and that it is smooth with ideally no play. If the bearings have been salvaged, but are not in perfect condition, or if they have been replaced with new ones, but the hugging cups are not in the best condition, then it may prove impossible to get rid of any play, without binding resulting in the turning of the forks. If this is the case, allow a very small amount of play, just enough that the forks turn without feeling the are ‘indexed’ or notchy.Refit the front wheel, and place the bike on the ground. hold the front brake firmly and rock the bike forwards and backwards to give you an indication of how much play you have allowed. 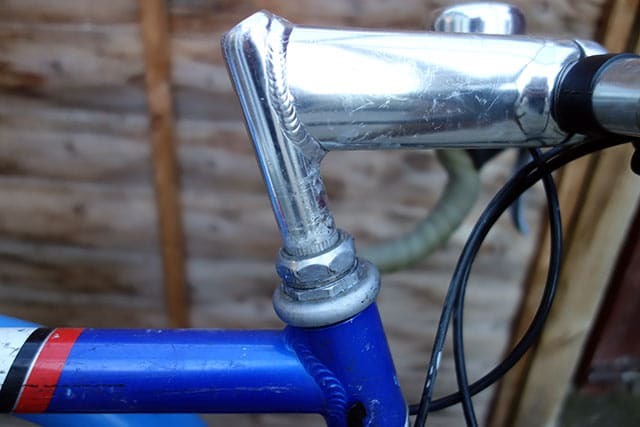 A proper solution (new headset) will mean that adjustment allowing smooth turning of the forks with no play in the bearing assembly can be achieved. Long term it would be better to replace at least the bearings, or more ideally the headset its self. Fitting 56 outer chain-ring to TT bike – Di2 manages the shift from 39 to 56 OK! My bike has some of the squeaking you mention, so it’s probably time for me to fix that. I’m not sure I’m confident enough to do it myself, so I’ll probably take it to a shop. I plan on taking it in soon, but I’m curious–what are the consequences if I wait a while? Is this going to develop into something dangerous? It’s hard to say. It’s probably OK, but you never know.